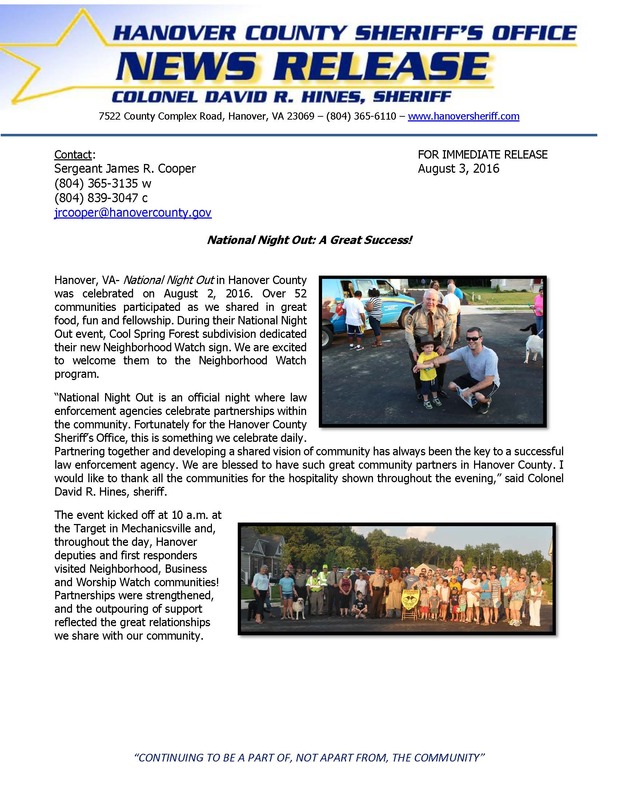 Hanover, VA- National Night Out in Hanover County was celebrated on August 2, 2016. Over 52 communities participated as we shared in great food, fun and fellowship. During their National Night Out event, Cool Spring Forest subdivision dedicated their new Neighborhood Watch sign. We are excited to welcome them to the Neighborhood Watch program. “National Night Out is an official night where law enforcement agencies celebrate partnerships within the community. Fortunately for the Hanover County Sheriff’s Office, this is something we celebrate daily. Partnering together and developing a shared vision of community has always been the key to a successful law enforcement agency. We are blessed to have such great community partners in Hanover County. I would like to thank all the communities for the hospitality shown throughout the evening,” said Colonel David R. Hines, sheriff. The event kicked off at 10 a.m. at the Target in Mechanicsville and, throughout the day, Hanover deputies and first responders visited Neighborhood, Business and Worship Watch communities! Partnerships were strengthened, and the outpouring of support reflected the great relationships we share with our community. These programs connect with our neighborhoods, businesses and faith communities through continual communication, education, and working together. In these programs, citizens are afforded an opportunity to learn more about their Sheriff’s Office, partner together and become better aware of events in their community. To learn more about the Hanover Sheriff’s Office watch programs please contact Deputy Barry Bland or Deputy Jim McLaughlin at 804-365-6110 or check out our website at www.hanoversheriff.com.